Camp MAINT Manager (CMM) Software is a simple and affordable system for Campgrounds RV Parks and Mobile Home Communities that can assist them in hiring the most qualified Managers and Work Camper for the job, including managing the Maintenance Duties and Activities they perform more effectively, all from a single system that was designed for the non-technical user. Own more than 1 campground? No problem. Install on a Windows Tablet, Notebook, Laptop or Desktop device at up-to 5 campgrounds, all under 1 license. See CMM Software How-It-Works Instructions for details. That is less than 6.5¢ per month for each campground Windows device. The above price includes 1 hour of "FREE" phone training, software upgrades and support for 1 year. Contact Support to request your 1 hour of "FREE" phone training. Contact Sales for enterprise and government pricing. 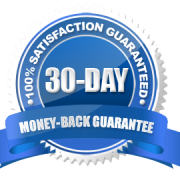 We are so confident that you will love our software, if you are not completely satisfied, you will receive a full refund.